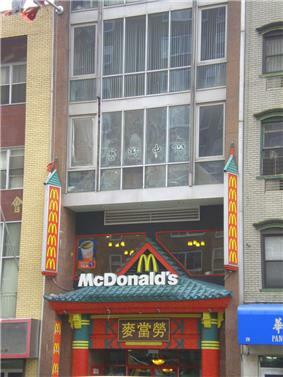 AAAC's previous home above a Bowery McDonald's. The Asian American Arts Centre (AAAC) is a East Coast, especially the greater New York area, some of the West Coast and some artists in Canada, Hawaii, and overseas. The artists include Asian Americans producing art, Asian artists who are active in the United States, and other Americans who are significantly influenced by Asia. The mission of the Asian American Arts Centre is to affirm and promote the preservation and creative vitality of Asian American cultural growth through the arts, and its historical and aesthetic linkage to other communities. The Arts Centre accomplishes this by presenting contemporary and traditional art exhibitions, performances, public educational programs, publications, and the artists archive. The archive documents, preserves, and promotes the presence of Asian American culture in the United States. Asian American Arts Centre was founded in 1974 in New York as the Chinatown, Manhattan. A visual arts program was initiated in 1984 called Asian Arts Institute. The current name, the Asian American Arts Centre (AAAC), was adopted in 1987 to encompass both the dance company (AADT) and visual arts programs. Based in New York's Chinatown, the Arts Centre has held many of its programs in other sites and locations in the country. The Arts Centre began the Community Art School and the Arts-in-Education program in 1978, and the Asian American Artists' Slide Archive in 1982. The exhibition catalogue production begun in 1983, and the Traditional Arts Presentation and Documentation program began in 1985. The Artists-in-Residence program that supported nineteen young artists concluded in 1993. The Arts Centre has also produced exhibition catalogs, videos, and sound recordings that documented visual arts, oral traditions, music, and performances. ARTSPIRAL, formerly an annual publication issued by the Arts Centre, focused on cultural issues. After 1993 the Arts Centre's programs consisted of four areas: art exhibitions and its archival documentation, folk arts presentation and research, education, and the development of a permanent collection. These programs encompassed preservation of the living Asian traditions as well as creation of contemporary forms. The annual visual arts exhibition program started in 1983, which consists of three to five contemporary visual art exhibitions and one folk art exhibition each year. The annual exhibition presents young Asian American artists or artists significantly influenced by Asia. The Mid-Career Artist Series focuses on the achievements of one or two mid-career artists. The Folk Art program takes a form of performance, lectures, and exhibitions, and presents traditional artists during the Lunar New Year every year. Contemporary artists who have exhibited at AAAC include Mel Chin, Martin Wong, Alfonso A. Ossorio, Vito Acconci, Luis Camnitzer, Barbara Kruger, Faith Ringgold, Wafaa Bilal, Tseng Kwong Chi, Dinh Q. Lê, Kip Fulbeck, Tomie Arai, Swati Khurana, Gu Wenda, and Zhang Hongtu. Fred Wilson guest curated "Aurora" on March 8, 1990. Previous exhibitions include: 1982-1983, "Eye To Eye" This was the first panel on the East Coast bringing together Asian American visual artists to discuss mutual concerns. A slide show of 21 important artists was presented. Panel Discussion: David Diao, Margo Machida, Lucy Lippard, Lydia Okumura, Kit Yin Snyder, John Woo, John Yau. Participating artists included: Arakawas, V. C. Igarta, Alan Kikuchi, Isamu Noguchi, Kunie Sugiura, Robert Yasuda, E'wao Kagoshima, Chao Chung Hsiang, Kim Won Sook, Helen Oji, Keung Szeto, Emily Cheng, On Kawara, Hisako Kobayashi, Manuel Rodriguez, Paul Wong, The-Ching Hsieh, Kazuko, Moon Mi-ae, Toshio Sasaki, Tony Wong. Currently, the public education program offers gallery talks, performances, t'ai chi workshops, and a Saturday Community Art School for children on site. The off-site programs take places in public and private schools, and other community sites in the five boroughs in New York. The Centre includes a digital and physical archive. The digital archive is called artasiamerica and is accessible online. The physical archive is stored within different Manhattan sites in Manhattan. ^ Ng, Fong Ten, et al. (1991). Singing to Remember. (VHS tape) New York: Asian American Arts Centre. Asian American Arts Centre (). Public art in Chinatown : sculpture, drawings, models, plans. New York : Asian American Arts Centre. Park, Young M, et al. (1999). Cross-cultural voices II : between memories. New York : Asian American Arts Centre : Korea Society : Stephen Gang Galler.